Photograph shows (Front row, L-R): Robert O'Lone, Paul Proulx. 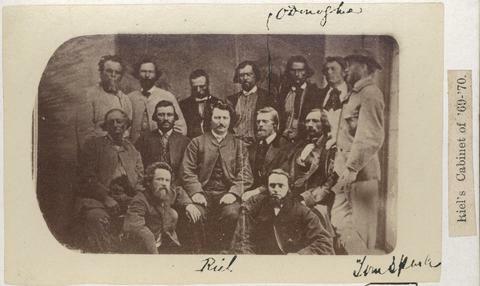 (Centre row, L-R): Pierre Poitras, John Bruce, Louis Riel, John O'Donoghue, Fran'ois Dauphinais. (Rear row, L-R): Bonnet Tromage, Pierre de Lorme, Thomas Bunn, Xavier Page, Baptiste Beauchemin, Baptiste Tournond, Joseph (Thomas?) Spence. (Source: Library and Archives Canada / PA-012854). Date of photograph is approximate, ca. 1869.